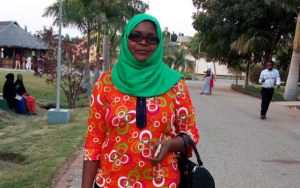 Zaina Hussein, a Ph.D. student at the University of Dodoma in Tanzania, is here at Ohio State this fall as a visiting scholar working with Asst. Professor Audrey Sawyer in the School of Earth Sciences. Hussein, Sawyer and others are collaborating with GWI on a groundwater survey of rural Tanzania to fill a critical data gap in that area. Hear more about this effort as Sawyer and Hussein discuss their work on Wed., Oct. 18. In this interview, Hussein sat down with GWI communications assistant Jazmyn Mustafa to talk about her background and research interests. Why did you decide to pursue an advanced degree? My friends and family kept telling me that I am a teacher. They always said I was good at explaining concepts. In class, I like to take the lead. I describe assignments to peers when the instructor is vague. Being a professor wasn’t originally the route I planned to take, but now I really appreciate teaching. The most important thing to me is that action trumps theory. Although the theory is essential to understand fieldwork, I always take my students to project sites. That way, they are familiar with real-life practices. They need to know what is happening in the industries. Can you explain your role with GWI hydrology initiatives? I am working on the Sustainable Village Water Systems project. I am working on the hydrogeological investigation for the rural part of Tanzania. We have started data collection in eight regions of Tanzania. We are now pr eparing a manuscript from the data that we have. 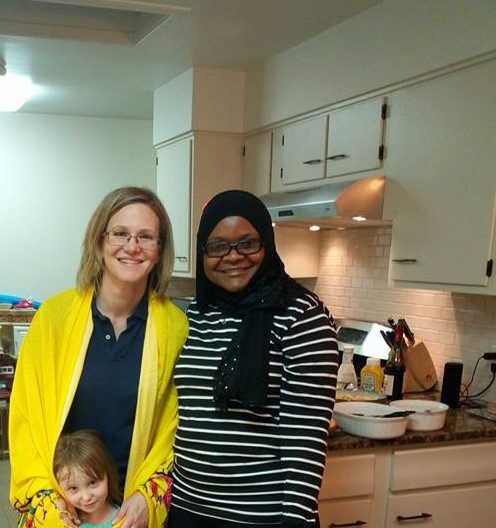 The professor I am working with, Audrey Sawyer, was matched to me through this program. Since the University of Dodoma has a partnership with Ohio State, I am coming to the States to do research with Audrey. My Ph.D. is on what the groundwater will be like in 10 years to come. Could it sustain us, and if not how should we respond to our water supply? I am doing tests with technology like GIS and modeling to gather data for my research. When out of the office, I am a busy mother of two children. On the weekends, I tend to a 100-acre sorghum plantation shared with my husband. The sorghum plantation is used for oil production in Tanzania. What are you most excited for while you are in the United States? I am so excited for the program at Ohio State. Everything has been organized, from university to home. I especially appreciate the computer system available at Ohio State. The computer system in Tanzania does not have an ID for log-in any computer, so I like Ohio State’s system because it prevent unwanted people to access the system. It makes me feel safer. What are some challenges you’ve faced in your days here, and how did you overcome them? The challenge that I faced so far is technical. I had trouble with electricity connections and cables because I have a laptop with a Japanese adapter. It does not work in the American outlets, so I am working on my cell phone for now. Yesterday I ordered a new adapter online, so hopefully, my issue will be fixed! What is a long-term goal you have? My long-term goal is to become the best researcher in the world. 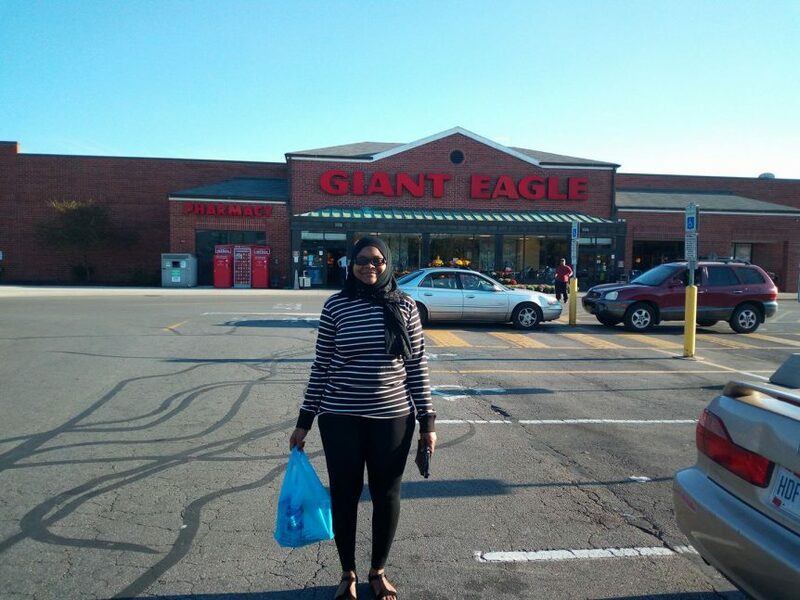 Main Photo: Zaina Hussein must be in Columbus–she is shopping at Giant Eagle! 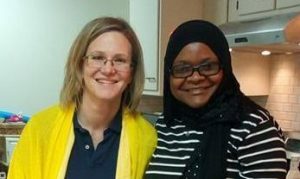 Below: Zaina Hussein and Audrey Sawyer. Source: Zaina Hussein.